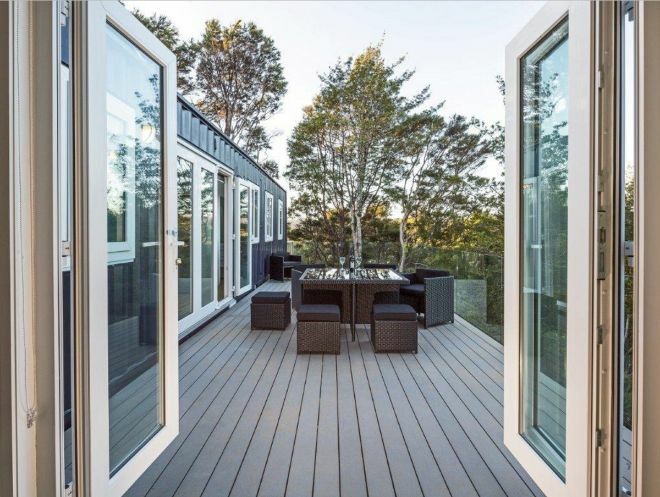 Brenda Kelly sells IQ Container Homes, tiny homes built from sea containers. 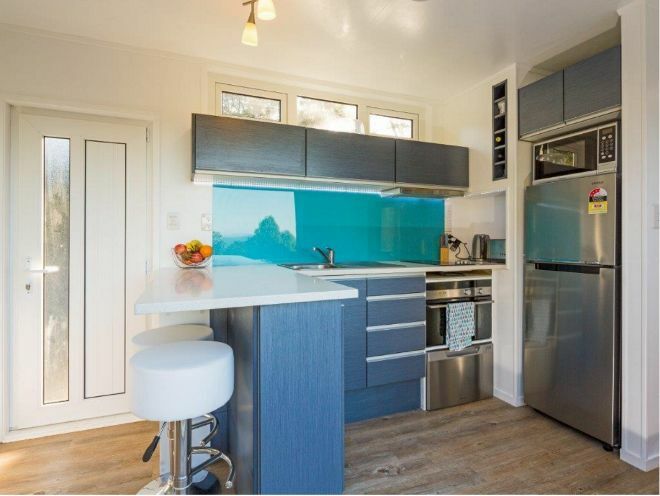 IQ Container Homes is located on Waiheke Island, New Zealand. 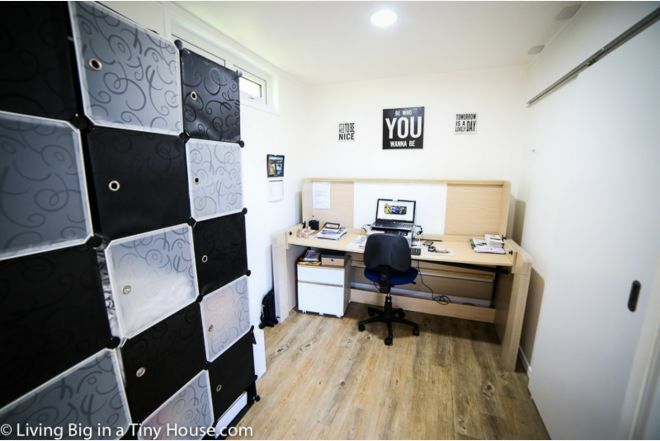 In a YouTube interview done by Bryce below, Kelly reveals that she has been living in her container home for one and one-half years and absolutely loves her tiny space. 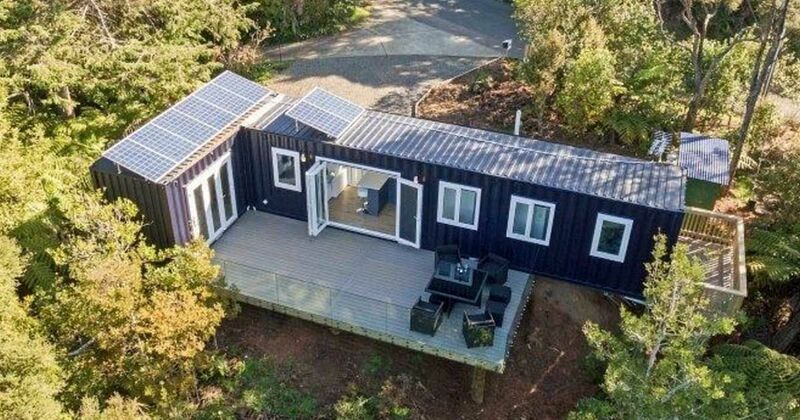 The first part of her home was a 20-foot (6 m) container. Since that time, she has added an additional 40-foot (12 m) container to it. 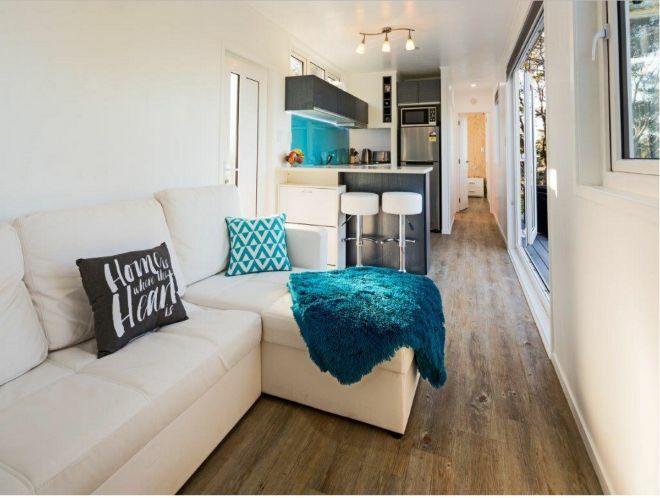 When asked if she misses her smaller 20-foot (6m) home, Kelly says no, but she learned some valuable lessons in working with a smaller space: Having furniture with multiple functions is one of the keys to tiny living, and not accumulating "stuff" just because you have the space is another thing she mentions. Between the two containers, Kelly's home now has 484 square feet (148 square meters). Upon entering Kelly's home, one of the first thins you see is an amazing porch off the back. The kitchen and living room flow into each other, maximizing the space. Underneath the lounge is extra storage, and the lounge also turns into an extra bed. The kitchen has a refrigerator/freezer combination. A two-burner stove and oven combo allows you to still cook and entertain. The large deck is enclosed so you can enjoy the outdoors in both the summer and the winter. It also gives you extra space to entertain and keeps you from feeling too enclosed. The bed in the master bedroom has extra storage underneath, and full-length mirrors give the illusion of space. The 20-foot container has become the office and guest room. 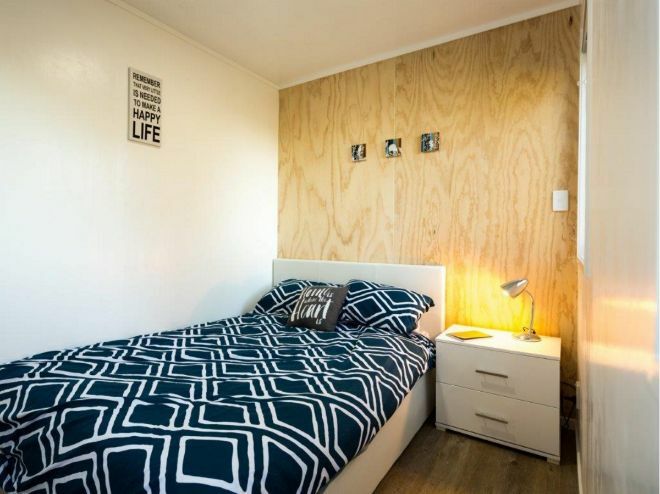 The desk turns into a single bed, and the couch behind it has a Murphy bed that pulls down to create a double bed. 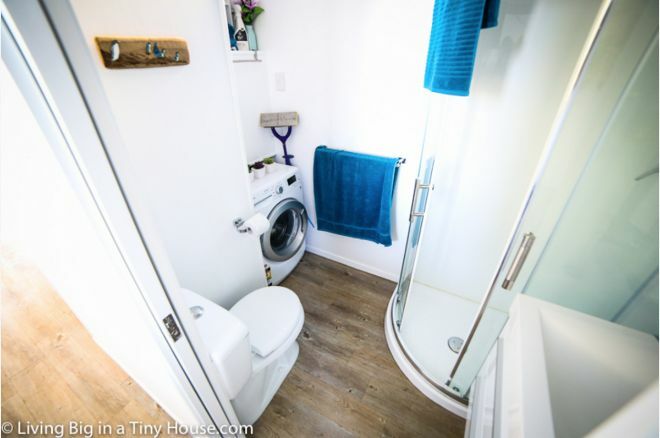 The bathroom has a flush toilet and full-sized washing machine. A shower is also in the space. The water is provided by rain collection, although potable water comes from city utilities. 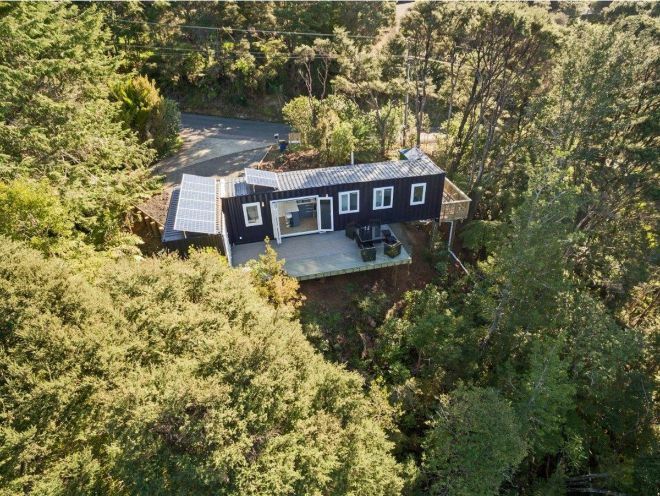 Solar panels provide almost all the power for the home; what Kelly doesn't use, she sells back to the city. If she needs extra at any given time, she is connected to city utilities and can draw electricity from that if she needs to. With wise use of space and multi-function furniture, Kelly has discovered that you can definitely live "big" in a small space.